The seventeenth Andrew Barnett Memorial Lecture takes place on Thursday 12th October at 7:30 pm in St. Andrew抯 Church, Bilston Street, Sedgley. Dr Paul Collins, the well known local historian and rail enthusiast, will be sharing his passion for trams with a talk and slide show on the unique tramway which ran over four miles from Amblecote to Kinver in the first thirty years of the C20th. This is an evening of pure nostalgia - not to be missed. Paul has written over fifteen heritage-linked books and has an outstanding collection of pictures and slides used to illustrate his material and presentations. Dating a building is quite a challenge. Usually a suggestion of 慓eorgian�, 憁id Victorian�, 憈he 1960s� and so on, will satisfy most casual observers. Often precise dates can be found on foundation stones and nameplates. Here the date is given! Just locate the property and come up with its original use. George Cox, the Society抯 President, gave the first of many correct answers. No doubt 1922 rang a bell � he was born the previous year!! 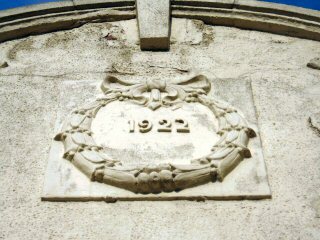 The date plaque is above what was Dudley Co-operative Society抯 newly built outlet on Sedgley High Street. This replaced their first shop on the south side of the Bull Ring. On Saturday 10th December 2005 the 1st Sedgley Scout group raised the village flag outside Somerfield supermarket in Dudley Street. 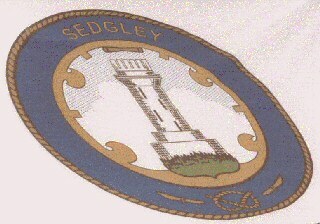 Based on the late Victorian civic badge of the defunct Sedgley Urban District Council, the flag shows the Beacon Tower, surrounded by a blue annulus edged with rope and a lock barrel above two pen nibs and the Stafford Knot. Read more about the new village flag here.